A Little ASOS Haul | emma etc. I haven't placed an order on ASOS in a while so I thought I'd pick out a few things that I needed/wanted. 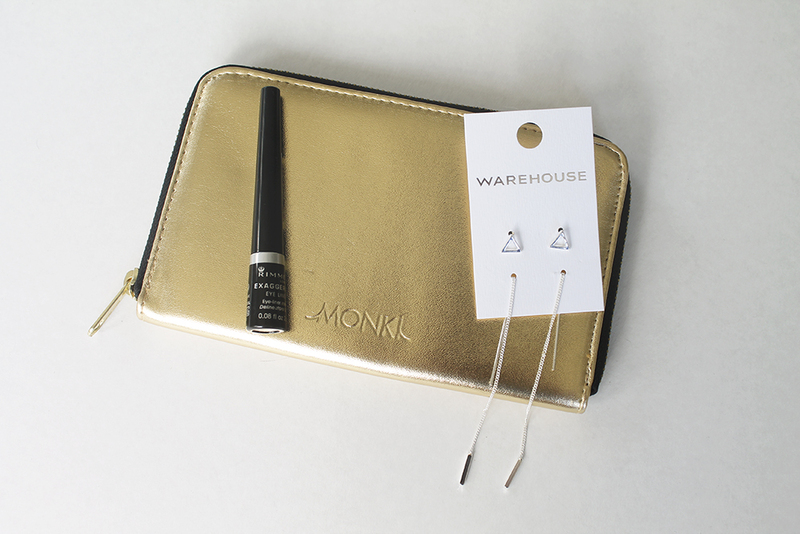 No clothes this time, but a gold purse, a new liquid eyeliner and some cute earrings! I needed a new purse because I had a coin purse that had previously housed all my cards and things but it was just too small and became a bit messy. I decided to go for this gold number from Monki which is a good sized purse that can fit all my cards, cash, coins, receipts, etc in it. I literally use my purse all the time to pull out my hop card and eftpos card since I'm going to Uni now. On a side note, I absolutely love the brand Monki and stalk that part of asos a whole lot - I'll have to try out some of their clothing another time. I wanted some new earrings because I literally have none that I wear. I spied these Warehouse ones which have a simple triangle and some thread through earrings, both in silver. I had seen someone wearing these sort of thread through earrings before and I wanted to give them a go. I'm not convinced I particularly suit them but I'll see. I'm thinking an all black outfit would be good with earrings that are a bit more of a statement than I'd usually go for. Lastly I bought a new eyeliner! It's Rimmel's Exaggerate Liquid Eyeliner which looks really amazing. I haven't tried it out yet but I can just tell it's going to be good.